With the number of chemicals, pesticides, and other unnatural residues found on and in our food these days, many people are turning to growing their own edibles. Since there are often significant quality improvements gained from home-growing food, this is often a great thing for both sustainability and the health of the growers (see this link for 10 Reasons You Should Grow Your Own Strawberries). With the trend being toward more gardening, even those with less space are beginning to venture into the realm of produce production. One of the challenges of growing food for the freshly-minted green thumb is deciding on space. Most rural or semi-rural folks simply dig a hole, put seeds or strawberry plants into the hole, and let the plants do their thing. Even city slickers often will have a usable section of their yard or space to build a raised-bed garden. Urban dwellers can often find an area for a community garden. But, particularly for those living in urban areas, space-utilizing tools are often employed to grow food in areas of contained soil. Usually, pots on a window sill or porch are used. However, there is a new kid in town: the Topsy Turvy. 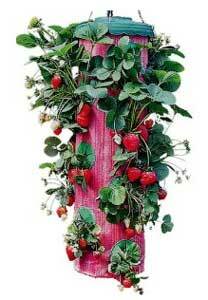 There is also the Topsy Turvy Strawberry Planter, which is slightly better suited for strawberries. This post is a discussion of the pros and cons of growing topsy turvy strawberries. Topsy turvy strawberry planters can provide several benefits to the gardener or green thumb looking to use them to grow their plants. First, the planters themselves are not too big and can be hung virtually anywhere. This can allow placement where it is harder for ground-borne pests to get at them. Slugs and other creepy-crawlies will have a difficult time traversing upward to get at your harvest. However, they may become more visible to hungry birds. They are also relatively small, making them easy to place virtually anywhere there is a few cubic feet of available space. They are also attention-grabbing. Due to the fact that they aren’t widely used, their status as a novelty is likely to get both questions and attention from your neighbors or visitors. While it is undeniable that using strawberry planters is a good decision for some people with significantly restricted options available to them, most people will find the most success growing their strawberry plants in the ground to avoid the problems that can arise when using the hanging strawberry planters. First, growing strawberries upside down is simply unnatural. In this arrangement, plants start growing downward, then try to grow upward toward the sun to maximize photosynthesis, and then are often pulled back downward by their fruit loads. This down-up-down process puts unnecessary and unnatural stress on the plants. Second, root systems of virtually all plants grow downward into soil or other nutrient mediums. In the topsy turvy planters, this natural process is somewhat thwarted. The plants are expected to grow downward while the roots are planted in the soil above. If the roots continue to operate according to nature, they will try to grow out of the soil and toward the plant in the search for additional nutrients. While the topsy turvy strawberry planters are better than the completely upside-down planters, there is still little support for the vegetative parts of the plants which, when ready for harvest, can pull on the root systems and cause undue strain just as if it were an inverted strawberry planter. Third, inverting strawberry plants not only stresses their structural architecture, it also increases the likelihood that they become diseased. Strawberry plants are often susceptible to fungi and other pathogens. With the topsy turvy planters, watering the plants often results in the hanging plants getting soaked repeatedly with dirty water as the soil is watered enough to keep it moist. The increased moisture can create a favorable environment for fungi. Fourth, while the plants in planters may be easy to water, they tend to dry out. Strawberries are notoriously finicky about their water requirements (too much and they’ll rot, to little and they’ll die). Because of this, additional care is required to see that evaporation loss does not lead to plant death. Consequently, more water may be uses during hot weather. And, excess watering can diminish the quality of the soil by flushing away needed nutrients. Fifth, hanging strawberries are also more susceptible to freezing in the winter months. Without special care, your strawberry plants will likely suffer cold injury without additional precautions. With cold weather, the topsy turvy strawberry planters will often allow the cold to kill the plants, thus causing you to lose the benefit of strawberries being perennial in nature. If you are going to grow strawberries upside down, know what you are getting into. While it may be a novelty to go all strawberry topsy turvy, the plants will likely do much better (and be happier) in a traditional, right side up position. You are asking for trouble (dead plants) if you use the typical upside down planters with the hole in the very bottom, and it is not recommended at all for strawberries. 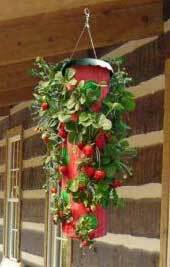 Using the topsy turvy strawberry planter is a better option than the typical topsy turvy tomato planter as it minimizes the problems above, but ground growing is still the best method for growing strawberries. If you have a success or failure story about growing upside down strawberries, use the comments below to share! I love Topsy Turvys I plant tomatoes in the strawberry ones and have 15 plants and they do great. I see you can row cucumbers and I am trying that this year. I saw a comment above about not growing strawberries and tomatoes together. What about cucumbers and tomatoes? I have just been given a Topsy Turvy Strawberry Planter. I have a cayenne pepper plant growing in a regular Topsy Turvy. I planted it in April 2015. It is now July 2016 and I always have fresh picked cayenne peppers. During the winter I kept it in an enclosed, heated porch with a southern exposure so it had full sun all day. I now have a Sweet 100 tomato plant in another Topsy Turvy and will be picking tomatoes within a few days. I will be planting strawberries in my Topsy Turvy Strawberry Planter this week and it, along with the cayenne pepper and sweet 100 plants, will winter over in the same spot that proved so successful for the cayenne pepper. Next spring I will let you know how this turned out. I’ve found that the best use of these planters is for growing peppers. I just have a hard time finding them each spring. I have tomatos growning in one of these with the side holes it says i can grow herbs in the top would i be able to do strawberries instead? Yes, you probably could, but it isn’t advisable. Tomatoes and strawberries shouldn’t share the same soil. Good luck! Does the topsy turvy planter already come with seeds?? It depends on where you buy them. Most don’t come with seeds. They usually either come empty or with plants. Good luck! It depends on what type of strawberry plants you are growing. If you are growing a June-bearing variety, you will get one large crop. Everbearing varieties produce 2 smaller crops, usually. Good luck! Yes, it is best to germinate strawberries prior to placing them in a planter. Good luck! I wish I had researched this a bit more. We bought a Strawberry Topsy Turvy on clearance and thought it included seeds which just needed soil. It did not. So, we purchased three varieties of nice premium strawberry plants and went on our way. We were initially excited, saw a lot of flowers and took that as hopefully a lot of strawberries! I followed the water instructions and left it hanging. Weeks later I moved it to the flower garden, cut some of the vines and flowers off to help the others perhaps as nothing had been happening. We got a total of four itty bitty strawberries. It has been a disappointment. Now I am trying to salvage the plants for next year where they will go in the ground for better results. I’m sorry to hear about your experience. I’m sure they will probably do better in the ground next year. Good luck! Someone gave me a topsy turvy upside down said all I had to do is put the dirt in it will go strawberries. Do I have to buy them to put in to grow or they come in the bag? You have to buy the strawberries to put in the bag. Good luck! As city dweller with only a balcony and a sidewalk, the hanging planter is my only option. I’m going to give it a shot. Sounds good, let us know how it works for you. And, good luck! I haven’t tried the strawberries with topsy turvy, but I have tried Green and red peppers and tomatoes and they turned out great. I’ve read some of the comments and I don’t think I will try them now! Thanks everyone for the information. I just found out about propagating the runners last week on a youtube video and I about DIED from excitement! Questions: Some of my runners were already 2-4 nodes long, and so I pinned them each down to propagate. -I realize it might take longer to form the roots, but is it ok to try to keep all of the clones instead of just using the closest node and cutting off the rest? -Also, the how important is it for the leaves on the cloned node to get sun, or is it just more important that the leaves of the mother plant get sun? Yes, you can root each runner plant. Once the root contacts the soil, it will work to establish itself there, and, eventually, be an independent plant. It is important for the runner plants to get sun as well. It will speed the process up and help them increase their vigor. Good luck! Have strawberries in an upsidedown planter. There are lots of strawberries growing but when I went to pick the first red one today it was like cujo berries. There was little mounds of white foam on the plant. Some on the leaves some on the strawberries. I have never seen or heard of this before. Any ideas? Honestly, I’m not sure what that could be. It might be the eggs of some insect or some type of infection. You do not water plants everyday. Only when they are thirsty. They will let you know,or you can stick your finger inside dirt. Only water when dry. This goes for all vegetables. And fruits,that I know of. cooler temperatures require less watering. I started four topsy turvy planters about three weeks ago. The day after I planted them I read tthese comments and was extremely worried because I’ve never been great at gardening. However, I decided to give it my best. Well, they are doing great as of now and I’m keeping my fingers crossed. One of them contains 18 strawberry plants, another is a single tomato, another is bell pepper, and then I did a variety in the fourth: cucumbers, bell peppers, oregano, cilantro, dill, and basil. The ones that have done amazing so far are the herbs and the tomato (I’ve just come inside from clipping some of the herbs). Great! I’m glad your plants are doing well. Keep us posted on how the strawberries do, and good luck! Unfortunately, the Topsy Turvy planters tend to be more difficult to use when growing strawberries. The tube-in-the-center method does allow better distribution of water, but it is still difficult to keep the plants hydrated adequately/appropriately. Also, the roots can get too hot, depending on your climate, and cause problems as well. With strawberries in planters, the bigger the planter, the better. Good luck! How can I tell if my strawberries are dead or alive? I planted them last year in a topsy turvy planter but I wasn’t super great about watering them. They were inside for most of the winter and are out on my covered patio now. There are still leaves and stems on almost all 15 of the plants but they are all brown. Should I trim them or does that mean they are dead and how long should I wait before deciding if I need to replace the strawberry plants. I would really like to be successful this year with my patio gardening. They could be dormant, but if you didn’t water them, they are likely dead. You can wait until the weather gets a bit warmer to see if they put out new leaflets from the crowns if you want to be sure. Good luck! we have always had such great luck with our strawberries and have grafted the babies, it was just WONDERFUL!!! well we moved and we know it takes a couple seasons to get the grass and flowers and what not the proper way they should be, so we tried out the topsy turvy strawberry plant until we got things growing the way we wanted and would start a ground garden, we spent so much money on actual strawberry plants and had the topsy turvy only to have them all die! i am beyond upset! only 3 plants lived so i transported them to pots until we make our garden, we had wonderful luck at the last house with planter gardening. i’m going to see if i am able to revive them, my topsy turvy will have some artificial plants put into the holes and then it will serve to hold my gardening tools. i am beyond upset by this, but it does not work!! !the plants at the top were the first to die by the way. the only 3 salvageable plants were in the middle. the bottom ones didn’t make it either. 🙁 they really shouldn’t sell these things! Thanks for sharing your experience. It is harder to grow strawberries successfully in the Topsy Turvy planters than by other, more traditional means. I’m glad you managed to salvage some! my s plants are going crazy. they are producing long stringers and im not to sure wha to do with them. i have 15 plants in each (2) so i may cut thge stringers off of one hanger to see what it does hoping it will strengthen the plant. this is the first year, planted 5 weeks ago and already have several ive eaten. yum. they are on an auto watering system every other day with the tomato plants catching the drippings below. what is one too do with the long stringers? See the following pages; they should answer your questions: Strawberry Runners, Strawberry Propagation, Transplanting Strawberries. Good luck! I have both the strawberry and tomato topsy turvy planters that I started about 4-6 weeks ago. The strawberry plants are not doing very well, although they have produced very few oddly shaped and quite sour strawberries. The tomato plant appears to be more robust, but it is not producing anything. I water them every day and feed them miracle gro once a week. Watering every day might be too much water for your strawberry plants. If the soil stays water-logged, the plants will die. Also, you might have other problems if the berries are malformed. See this page on Deformed Strawberries for possibilities. You made very good points that I ended up learning the hard way, I bought a Topsy Turvy Strawberry planter this spring and I purchased some (Berries Galore) ‘Ever bearing’ and put them in the middle and bottom and bought a few (Quinalt) ‘single bearing’ plants for the top hoping for some berries all season. We had a very tough summer here in Kansas this year (2011) and between the heat and probably me giving them too much water trying to compensate the middle and bottom plants all died (I thought the leaves were burning from the sun) but I later realised that it was over watering and from root rot however the Quinalt’s on top got better drainage and they have flourished even through the heat of upper 90’s and 100’s nearly every day (almost 50 days of 100’s this summer). I will disagree on your point of the leaves bending upwards causes too much stress, the ones that didn’t die from root rot have developed very thick strong leaf stems and don’t seem to be affected at all by their bending upwards towards the sun.